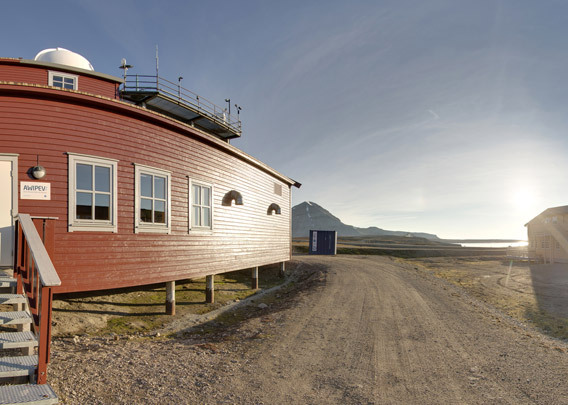 The Koldewey-Station is the station of the German Alfred Wegener Institute (AWI) in Ny-Ålesund. It is named after Carl Koldewey, the leader of the first German arctic expedition in 1868 which ended up in Spitsbergen. The term AWIPEV also includes the French research facilities in and near Ny-Ålesund. There is a lot of cooperation between the German and the French scientists. 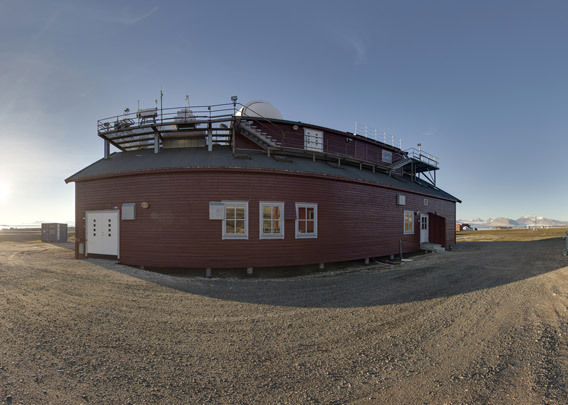 The so-called „Blue House“, more centrally located behind the Amundsen statue, is also part of the Koldewey Station, but it is not the place where most of the science is done. This is rather taking place in the building shown here. The sphere on the roof protects a LIDAR. This is something that works in a similar way as a radar, but it is based on laser technology and not on radar waves. Scattering and reflection of laser rays is for example used to determine the concentration of aerosols in the atmosphere. Other research of the Koldewey Station is dedicated to biology, mainly marine biology. This little building behind the main building of the Koldewey Station is also important. It is the balloon house, used to launch weather ballons regularly at the international times for meteorological observations. These weather ballons may reach elevations beyond 30 kilometres and they collect data including standard meteorological paramaters such as air pressure, temperature and humidity but also ozone concentrations to monitor what is commonly referred to as the arctic „ozone hole“.